Joe Namath once guaranteed Super Bowl triumph, and delivered. Rex Ryan pledged the same thing two years ago. His quest continues Sunday in Foxboro against the Patriots in their AFC Divisional Playoff Game. Forty-two years ago today, January 12, 1969, “Joe Willie” made good on his promise, defeating the Baltimore Colts16-7 in Super Bowl III. Not since then have the Jets had a personality quite as colorful or brash. 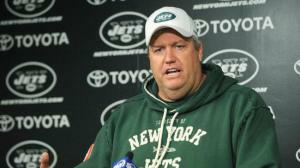 Since his arrival in New York, prior to the 2009 season, Rex Ryan hasn’t been coy with his intentions. He doesn’t just want to win a Super Bowl. He plans on it. During his introductory press conference, he assured Jets Nation of a pending trip to the White House following a title run. This summer, he even hand signed an ESPN Tour Bus with an inscription of, “Soon to be Champs.” Ryan is ultra-confident and doesn’t care who he offends. Ryan can thank Namath for the trophy he ogles over each day in Florham Park. 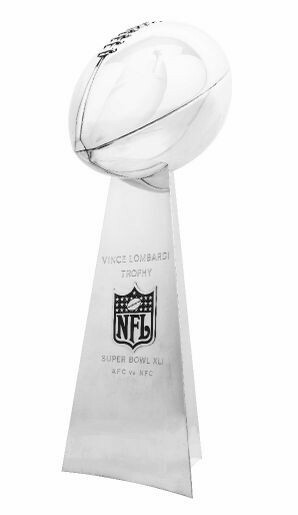 For forty-two years, that Lombardi Trophy has stood alone. Ryan insists he is the green & white Messiah to add another to the collection. He faces, perhaps, his biggest challenge this weekend. Coming off of an embarrassing 45-3 Monday Night Football thrashing last month, Ryan knows this rematch with New England will not be easy. However, he’ll tell anyone who will listen of his plans to pull off the upset and even out-coach the former HC of the NYJ, Bill Belichick. His bluster might seem dumb, or even reckless on the surface, but Rex Haters must understand one thing: he just doesn’t spew anything without purpose. Right or wrong, and always controversial, Rex Ryan takes calculated risks with each bold statement he dangles to the media. His intentions are almost always targeted at taking pressure off his players and coaches, and putting it squarely on his own shoulders. It’s hard to argue with the results. In two years, Ryan has posted an impressive 20-12 regular season record, made an appearance in the AFC Championship Game, and won a total of 3 playoff games (so far), more than any other Jets Head Coach in history. Love him or hate him, Rex Ryan delivers. If he can pull three more victories out of his Jets cap this year, and make good on his promise, he’ll own New York. Just like “Joe Willie” did, forty-two years ago today. The torch has been passed. Now, let’s see how far the kid can run with it. Prior to making his first professional start, New York Jets rookie Quarterback, Mark Sanchez met up with the only man to ever lead the franchise to a Super Bowl – Joe Namath. For over forty years now, long-time suffering Jets fans have savored Joe Willie’s performance in Super Bowl III, speaking glowingly about the iconic figure and his positive contribution to an otherwise abysmal team history. 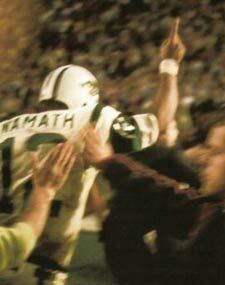 Sunday at Reliant Stadium in Houston, TX, Namath informed Sanchez that it’s time to move on. “…this isn’t about me anymore. It’s about you,” he told Sanchez. With that, a new era of New York Jets football began. Jets 24, Texans 7. Sanchez was confident and efficient, throwing for 272 yards including a 30-yard touchdown pass to Chanci Stuckey. He was masterful under pressure, converting 10 of 18 third downs. He exhibited great mobility in the pocket, and excellent decision making throughout. Sanchez’s play, coupled with a pair of big runs from Thomas Jones, and Rex Ryan’s“Ravenous” defensive scheme, left Jets fans giddy at what the future might bring. His quick start was reminiscent of the way another former New York rookie began his storied career. Thirteen years ago, with similar poise and passion to what Sanchez displayed yesterday, Derek Jeter wrote the first chapter of his legendary career. Now the all-time Yankees hits leader, Derek Jeter began his 1996 rookie season in Cleveland with a home run and a pair of dazzling plays at short stop. The sky was the limit that day, and for over a decade, Jeter has been as good as advertised. 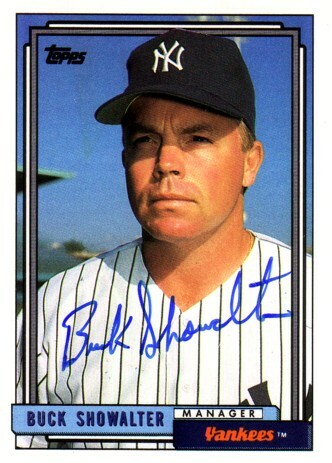 He further solidified his legacy on Friday night by passing Lou Gehrig’s hits total. On Sunday, the fiery kid from SoCal began writing his own legacy, chasing Broadway Joe along the way. One game into “Matinee” Mark’s career, he looks up for the challenge…even if it was only one game. The kid was ready, and so are Jets fans. In 1996, the Yankees, with a new manager (Torre) and a new leader(Jeter), built on chemistry carried over from the previous regime to capture the team’s first title in 18 years. It’s been over forty years without a Jets Super Bowl victory. Could a new coach (Ryan) and a new leader (Sanchez) do the trick for Gang Green too? Jets faithful burn for another title run – time will tell if Sanchez can light that fire with his new torch. 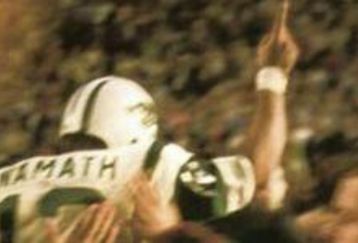 The 1969 New York Jets were as smooth as Joe Namath’s flowing brown locks. Forty years later, as the 2009 Jets prepare for opening day, that legendary club remains the signature team for an otherwise frustrating franchise. Everything went right that season for the green and white, the story is part of the fabric that makes up the NFL. Back in 1969, as everyone knows, the New York Jets tore through their schedule, dominated the competition, and then, in dramatic fashion…lost to the Kansas City Chiefsin the Divisional Round of the Playoffs? No upset for the ages? No merging of the leagues? No guarantee? No, actually, all of that happened the previous January during Super Bowl III, the culmination of the 1968 season. It was the 1968 team that overcame the odds and defeated the Baltimore Colts 16-7. That’s the club deserving of all the accolades so often misdirected towards the team from the 1969 season. Confused? Where did things get mixed up? Every season, the NFL declares its champion during the Super Bowl – typically held in January (sometimes February) of the following calendar year. However, this scheduling snafu has rarely caused any confusion…except in the case of the often overlooked 1968 New York Jets. For instance, the 1972 Miami Dolphins are the only team in NFL history to complete a perfect season. Yet, they won the Super Bowl played in January of 1973. At last check, no one has ever referred to the ’73 Dolphins as Perfect – that team lost in the Super Bowl to the Minnesota Vikings in January of 1974. Every Giants fan lives by their 1986 and 1990 Championship teams – even though both of those title games were played in 1987 and 1991respectively. Take it a step further: Slumdog Millionaire, deemed the top film of 2008, was crowned during the Academy Awards ceremony held in February of 2009 – the following year. Yet, years from now, film aficionados will refer to Slumdog as the Picture of the Year for 2008, not 2009. So why are the 1968 Jets almost always referred to as the 1969 club? Ever see a 1968 Team Signed New York Jets helmet for sale, advertised as such? It’s possible it has something to do with the symmetry of winning during the same calendar year as the ’69 Amazin’ Mets and ’69 Knicks. New York sports fans will always have a soft spot in their heart for that year of gluttonous winning – still no excuse for inaccuracy. In 2008, the Jets wore a commemorative patch to honor the 40thAnniversary of the Super Bowl III team – mathematical recognition appropriate for the 1968 club, and further confirmation of the championship team’s true identity. Regardless, forty years without a championship is a painfully long time to wait for such a devoted fan base. When Gang Green finally gets to hoist that Lombardi Trophy for the second time in franchise history, it will be a day, and a year, that no Jets fan will soon forget.